If you're allowed to dress with style on a regular basis, 2 tone type dress shirts are a fantastic way to exhibit your command of dressing to impress. These two tone french cuff dress shirts are made by Daniel Ellissa and are designed in Italy with stylish dressing in mind. 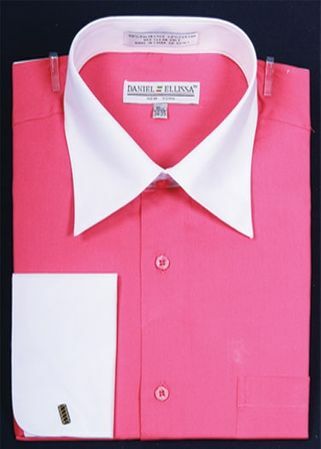 This Fuchsia 2 tone dress shirt features white french cuffs and collar and will really make you stand out in style. Made of easy care cotton/poly.